Letters home: Reflections on coming home from Indonesia March 3, 2005 "Homecoming"
Reflections on coming home from Indonesia March 3, 2005 "Homecoming"
I already miss the smell of the ocean and the thick heavy humidity of southeast Asia. It's something that hadn't happened to me before - this not being able to write or even describe a place or experience while I was there. I know I promised up-to-date emails of my activities but found myself at a complete loss for words every time I sat in front of monitor and keyboard. Where to start now that the icy blue of the New England sky and the snow on the ground tell me irrefutably that I am home. Should I start at the end with the last heartbreaking story of a month of numbing tragedies recounted for us - that of the 5 yo girl we put on the Indonesian military C-130 plane to Jakarta just as we were boarding our own US Marine C-130 to Singapore? How she lost her mother and siblings the day of the wave torn away from them and washed up on a mosque's steps a mile inland, brought to a hospital with a severe aspiration pneumonia - somehow found by her father who had been out of town - the two of them all each other had left in the world. How she was treated in three different hospitals, getting through skin grafts and the pneumonia how they finally were discharged from the 3rd hospital to an IDP camp nearly 6 weeks later to slowly begin their lives together again. She had a seizure and never regained full consciousness the day after her discharge and her father rushed her back to the hospital. How we found her on land in that decimated pediatric ward of the formerly proud Banda Aceh University Hospital in a corner crib unresponsive her father holding hand. Helicoptering her to our ship the might of America poured into a tertiary care floating hospital complete with CT scanner, Operating Rooms and ICUs. How the glimmer of hope in her father's eyes slipped back into despair as we discussed the CT and test findings with him. Massive hydrocephalus - from tuberculosis. The TB we could treat but we didn't have a neurosurgeon to relieve the hydrocephalus. So to Jakarta she was going as we were going home - her chances of survival and meaningful recovery meager - her father with the only thing he had left in the world still holding onto her hand as she continued to lay unresponsive on the stretcher. Still he pulled me close to him in a tight hug as we were leaving - thanking me in the only way he could - our differences in culture and religion shattered by love of this little girl. I will forever be haunted by the look in his eyes. There are happier stories - particularly from Ward 1 our makeshift "family" ward which functioned as the social center of the ship. Colorful origami figures hung from the ceiling and former strangers clung to each other for support. A large crowd gathered as we would round each day - as opposed to the fierce American need for privacy the Aceh people desired community in a way that is foreign to our discrete disjointed western lives. The day's triumphs and setbacks made their way in murmurings throughout the ward on each patient - when asked if a patient wanted privacy for some delicate test result the answer would always be a quizzical expression as if the question was too absurd for a straight answer. I never became fully comfortable in the month of daily rounding with the crowds we would gather as we moved from one patient to another. The benefit of the open bays - designed to house recovering wounded "subacute" soldiers, marines and sailors in a bygone era was that of dispersion of horror and grief. All had their own tragedy and for a short while on Ward one - no one had to go through it alone. The older women left without a family to care for took on the nurturing role for the young mother whose baby was recovering from extreme dehydration and electrolyte imbalance. A 15 year old girl whose arm was amputated because of an aggressive tumor took turns coloring with a 9 year old boy with a large mediastinal mass. The play room - lined with drawings first of coffins and waves which made way to happier themes - was not just inhabited by the children - the adults were often found lounging on the cushions, deep in discussions. If ever a ward itself could be responsible for healing - Ward 1 had a power of transformation deeper than anything I can explain. Elisa manifested this perhaps the best - she was our profoundly sad and withdrawn 17 yo girl with pneumonia and brain abscesses, paralyzed on her right side - having lost her mother and siblings in the tsunami - emerging from her cocooned grief to the warmth of Ward 1 and finally full of smiles as she found her voice again. The day of her transfer back to the ICRC field hospital when she was finally able to move her right leg for the first time in a month (the powerful IV antibiotics finally penetrating the abscesses in her brain) she burst out in giggles so loud that we couldn't believe they had come from her. 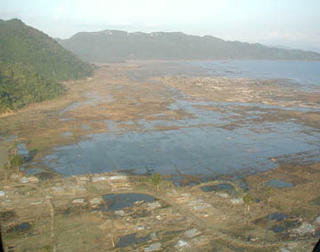 Flying in a helicopter over Aceh the dead brown earth where the saltwater had reached sometimes miles inland killing everything it touched was in stark contrast to the tropical greenness juxtaposed against all the death. Someone had described it to me as if a giant hand had come and scooped everything away in its path. Looking on it the first time the rendering was accurate. I couldn't stop myself from snapping pictures despite the determination not to fall prey to "disaster tourism." The magnitude of destruction was uncapturable in pictures however. Arriving on the scene nearly 5 weeks after the event, dead bodies were still being pulled from the mud. A school we visited was lined with flags in the schoolyard - each marking the spot a dead body had been found. The director of the university hospital had lost his wife and children and came back the same day to start digging out patients from the hospital. The heat and acridity of the air on land was accentuated because we were used to the clear saltwater breezes on the decks of our hospital. There is so much more to tell - the Navy culture - the amazing doctors and nurses I was lucky beyond measure to have met and worked with, football on the flight deck, seeing the southern cross in the sky and the 4 moons of Jupiter - but this is my best attempt for a start. Thank you so much for your thoughts and prayers as I was gone - I'm looking forward to catching up with everyone in person.